"We need to create a cutting edge and most impressive visual experience to one of the most demanding audiences possible" that was the briefing provided by the organizers of the International Collegiate Programming Contest - which is like the World Cup for software developers - for the scenario of the grand opening ceremony. The worlds top class software developers and company representatives of the powerhouses of the IT industry are difficult to impress - but that was the aim the hosting organization the University of Warsaw. The Warsaw Palace of Culture and Science with its historic Congress Hall one of Poland's most known heritage sites was chosen as a venue - and then it was stuffed with loads of cutting edge technology including Panasonic's new PT-DZ21K large venue projectors. Xyz one of Poland's leading artists created a concept for a show which was turning the historic site of the Warsaw congress hall into futuristic happening combining 2D and 3D audio-visual experience. For this a surround sound audio system was installed around the audience, same as thousands of light effects and several kilometres of cables. 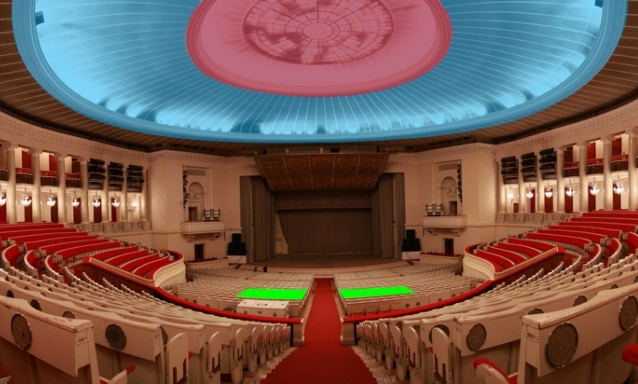 That was topped by multiple digital projections not only on the main stage but also to extended to both sides and as the cornerstone in this installation circular projection right into the 40m span of the multi-level dome ceiling of the congress hall, so that the audience on every seat was virtually surrounded by audio and visual effects. To realize the dome projection which was the most difficult part it required to place high resolution and high brightness projectors right in the middle of the audience. Getting approval for removing the historic for the first time since the congress hall was built up was the easy part. To place the projector in the middle of the audience a compact but powerful product was needed to avoid to lose to much seating capacity. With 12x 20.000 Lumen projectors in centre of the audience it was also key that the noise level of the projector is at a minimum, as otherwise the noise would be unbearable for the audience. Last not least the sheer size of the ceiling and the multiple steps in the architecture required high brightness, high resolution and pixel mapping technology. Such kind of projector did seem to not exist on the market according to XYZ of the rental company Wizja which was awarded with the tender to supply the AV equipment to this show. Then at ISE, Amsterdam they saw the Panasonic PT-DZ21K projector for the first time - that was the projector which combined all technical specs requested for this job. The decision was made to use PT-DZ21K despite a difficult planning process with a product which was not even launched to the market. Tests were undertaken with engineering samples, and close communication on product specs lead through the planning process until 12 machines have been finally delivered to the venue right before the event. "The PT-DZ21K was without alternative for this event" said Lukasz Nowak, Technical Manager at WIZJA, "as we needed a small and quiet projector that provides failure safe operation. The DZ21K had all required spec and with the multi-lamp system provides best safety against a blackout. At the same time the product provides a powerful performance with a very good brightness uniformity which is especially important in edge-blended projections. The 20,000 Lumen really is up to ANSI Lumen spec." Multiple edge blended projections including a complex dome ceiling projection plus a mix of 2D and 3D high resolution contents. This required a state of the art playout system as well. The 12x Panasonic PT-DZ21K and 6x PT-DZ110 using ETD75LE5 and LE4 lenses were feeded with video through an AV Stumpfl Wings Platinum and VIOSO system streaming content from a Catalyst Media Server and 7x Dual Core PCs switched through over a Folsom Encode switcher and monitored through Panasonic BT300 displays and finally projected into the ceiling and onto Tichler Super 3D Silver Screens. When the curtain opened for this multimedia experience combining 3D and 3D video contents with surround sound and real dancers and fluorescent body paints on stage and throughout the venue it did not only impress the close to 3,000 guests in the hall including the President of Poland Bronislaw Komorowksi and the President of Warsaw Hanna Gronkiewicz-Waltz it also pleased the organizers of the University of Warsaw who have chosen this most complex out of five different concepts that have been proposed for the opening ceremony and which represented the history and presence of Poland as country in the most modern and future oriented way.